Our float hunts put you on a river of outstanding beauty. 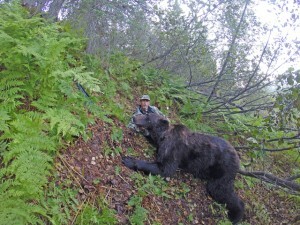 On a recent hunt, we spotted 11 brown bears, 23 black bears, two caribou, two bull moose, and a porcupine! The river offers great fishing for salmon, rainbow trout, Dolly Varden, and grayling, and the scenery is second to none! 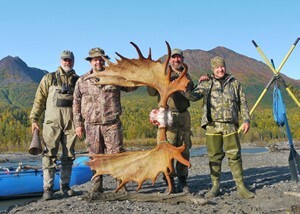 Moose are one of our more popular float-hunt animals, and they’re mostly found in the river bottomland. You may expect to do a little hiking to get to some of the better places, but moose are mostly a waiting game. You may do some calling, followed by long periods of glassing. Patience pays off, however, and we have often sat on a gravel bar for several hours, only to have a big bull come ghosting in right at dark. The float hunts involve camping in tents, and hunting on foot. 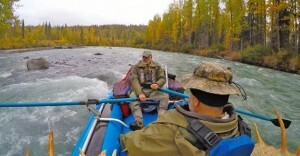 You’ll need chest waders and good rain gear on your float hunt. Be sure to check our float hunt gear list on our Gear Page for a complete listing of what you’ll need. 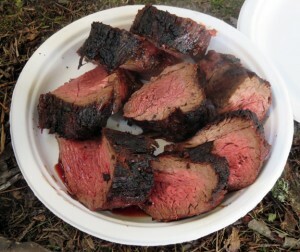 Both moose tenderloin and fresh caught fish over the coals, add to the total wilderness experience of a float trip–one you will surely savor even years after returning home. The rivers we hunt offer fishing opportunities for salmon, rainbow trout, grayling, and Dolly Varden char. Bring a rod along and sample some great fishing! 16″ Dolly Varden make for a great change-of-pace after eating Mountain House freeze dried meals.